In 10-inch skillet, heat oil over medium-high heat until hot. Add eggplant, zucchini, onion, bell pepper and garlic; cook and stir 4 to 6 minutes or until vegetables are lightly browned. Reduce heat to medium-low. Stir in tomatoes, tomato sauce, basil, Italian seasoning and pepper. Cover; simmer about 10 minutes or until vegetables are crisp-tender. Stir in beans; cook 5 minutes longer. Meanwhile, remove dough from can in 2 rolled sections; do not unroll dough. Cut each roll into 4 slices; cut each slice into quarters. Place cheese in 1-quart resealable plastic bag; add crescent pieces, seal and shake to coat. Heat oven to 375°F. Spray 11x8-inch (2-quart) baking dish with cooking spray. Spoon eggplant mixture into baking dish. Arrange crescent pieces on top. Bake 17 to 20 minutes or until crescents are golden brown. Sprinkle with parsley. Ratatouille originated in the Provence region of France. The combination of eggplant, tomatoes and zucchini shows the influence that Italian cuisine has had in this Mediterranean region. The eggplant mixture can be made a day ahead of time and refrigerated, covered. 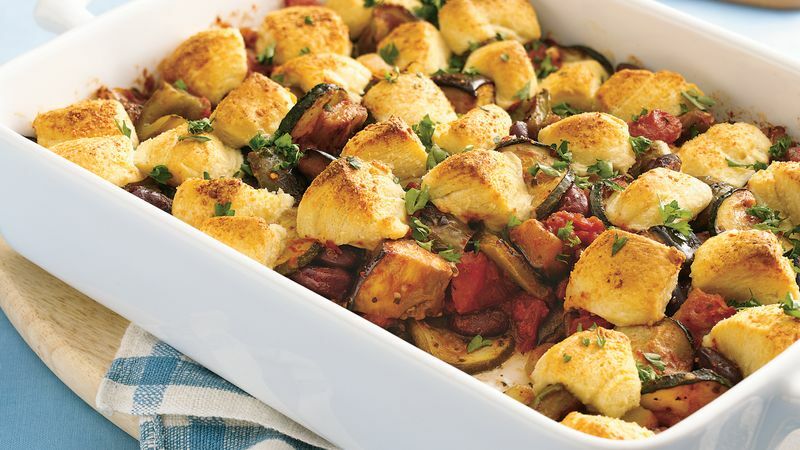 To complete the casserole, heat the ratatouille in the oven or microwave until bubbly; top with the biscuit pieces and bake as directed.